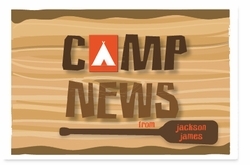 Send your kiddos packing for the summer with these fun camp-themed postcards to drop a line home. The back side features printed lines for a return address as well as marked areas for writing space and stamp. Thanks for stopping by! We hope you'll find a note card just right for your personal correspondence. Pink Peppermint Paper's selection of flat or folding note cards is unlike any other, featuring 100% original artwork and often customizable to suit your color scheme.